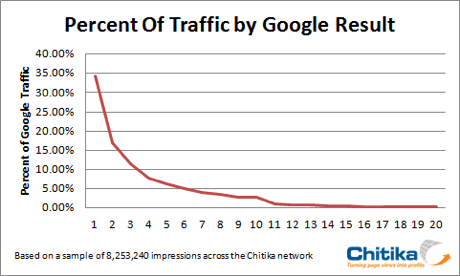 According to a recent study by Chitika, having the first position in Google search results is worth double the traffic of the second spot. The top position also drove 34.35% of all traffic in the sample, which is nearly as much traffic as slots 2 through 5 combined, and more traffic than positions 5 through 20 combined. Obviously having the top position has always been important, but this is a quantifiable study proving that having top search engine results. As always, having the top position in Google is a constant process involving the optimization of your content, link building, and building up trust with Google’s search engine spiders. It suggests, once again, that your website needs to be on the first page to get any real chance of being seen. Furthermore, to build a successful presence online you need to get your website into positions 1-4 for a variety of terms as those 4 specific Google positions combined command an astounding 70% of all traffic to websites!